The Bermuda High is a high pressure sytem that is only semi-permanent. It is like a wall that hurricanes can&apos;t penetrate, so they have to go around it. 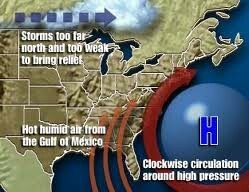 The Bermuda High has clockwise winds, and it pushes warm, humid air from the gulf through the Eastern United States. The Bermuda High can be found off the east coast of North America in the summer, and it moves east and west as it grows. The Bermuda High can get as large as 2000 miles across and 100 miles high. The Bermuda High moves the hurricanes around its edges, and it usually leads them to move up the East coast and back to sea. The hurricanes will travel west towards the United States, but as they get caught in the High, they move north and away. Since the Bermuda High determines the path of the hurricane, it can be used to predict where the storms will hit land. For example, the sooner the hurricanes turn the northern edge of the High, the less likely they are to hit the United States. The Bermuda Higth can also affect the strength of the storms. If the Bermuda High is weak, it will not cool the waters properly, and the warmer surface temperatures will give more power to the hurricanes. 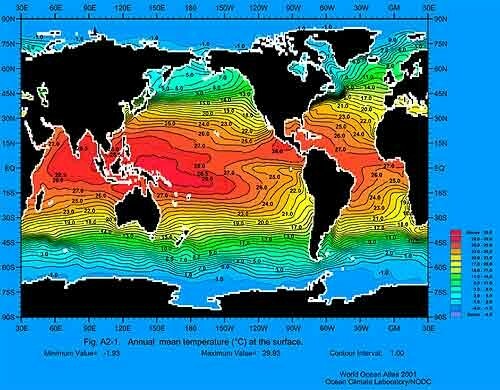 El Nino is a temporary change in the climate of the ocean, and it occurs near the equator. You will see an El Nino every 3-7 years in the winter, and they can last for more than a year. 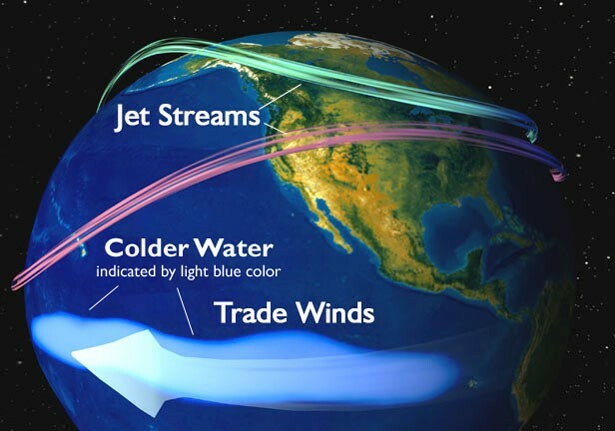 An El Nino is formed when the trade winds relax. Normally, the wind will blow strongly from the east to west, piling up water in the west. This makes that water warmer. While the west is getting warmer, the east gets colder. However, in an El Nino, the winds weaken and allow some of the warm waters to flow back to the east, making it warm again. 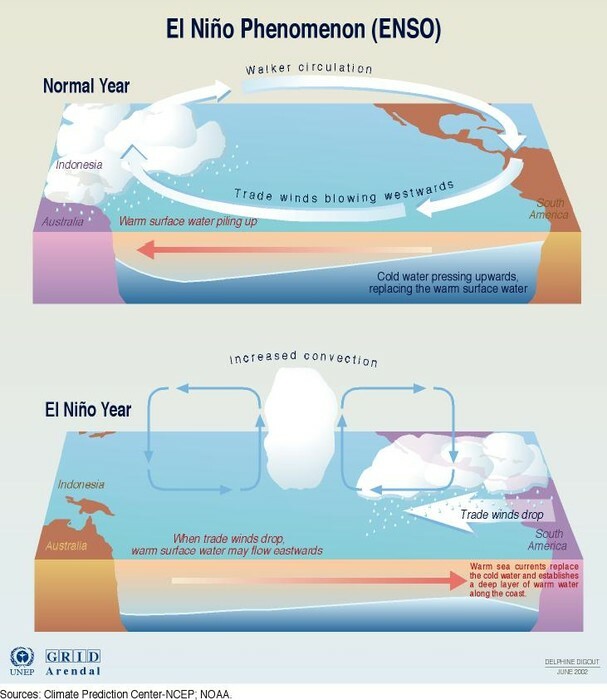 El Nino affects hurricanes because of the warm surface temperature. The warm water creates clouds and storms over the ocean, and these conditions can eventually create a hurricane. The warm water fuels the hurricane for a long time, especially since an El Nino only needs warm water and weak trade winds to grow. An El Nino also has other effects, too. They bring wet winters to the southern US, and droughts to other places of the world. An El Nino can usually be predicted up to 12-18 months in advance. This data is very important for making predictions about weather conditions, such as strong hurricanes. A La Nina is basically the exact opposite of an El Nino. The only similarity is that they both occur in winter. A La Nina is classified by the colder than usual ocean temperatures, and they bring weather variations. During a La Nina, it is wetter in the northwest US, and it is dryer in the south US. Water temperature can be changed easily. It can change because of an El Nino or even just by the weather outside. Water temperature is, simply put, the temperature of the water. Many scientists are worried about the increase in ocean water temperatures because of Global Warming. However, this rise in temperature is very good for the creation of hurricanes. The warmer the water is, the more clouds and storms there are, and when these things are present, it is very easy to create a hurricane. Once a hurricane is started, it feeds of the water heat and energy. When the water is warm, the water vapor creates rainfall, and that fuels the hurricane. However, if you were to take away the warm water, hurricanes would not be able to form. As you can see, just the smallest change in water temperature can change many weather conditions!